Squeenix’s second ever stab at an in-house MMO stumbled embarrassingly out of their front door two years ago wearing its pants on its head, looking and smelling like an unmitigated disaster. 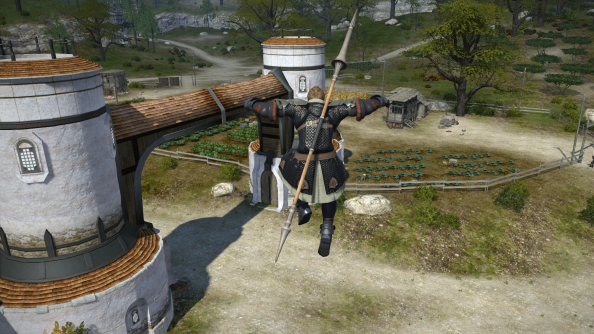 But given everything we know about Final Fantasy XIV: A Realm Reborn, there’s plenty to be optimistic about – between a new client, graphics engine, server and data structures, newly redesigned maps and a reassembled interface, this is an entirely new game, built by an almost entirely new team who know the genre, warts and all. Closed beta testers will next week be exposed to Full Active Time Events (FATE), new random events which will dynamically draw in players within their radius a la Guild Wars 2. They’ll also get to play with a brand new gamepad UI, if they’re so inclined, revealed at length here by producer, director and Guild Wars player Naoki Yoshida. There’s another new trailer below, though it’s less revealing. It spends about a minute looking indistinguishable from a Western MMO, bar the odd silly hat here and an occasional anime-sharp sword trail there, before throwing off its coat and running about with its chocobos and upside-down windmill castles on show.